I resonate deeply with this poem as it speaks to my personal journey with the tropical rainforests of Far North Queensland. Although I cannot claim to know all the trees of this forest, many are now familiar. I can roll off my tongue sleek-sounding scientific names of trees like Beilschmeidia bancroftii, Eupomatia laurina, Macaranga tanarius. It was self-gratifying to know these names, but this is no longer satisfying. 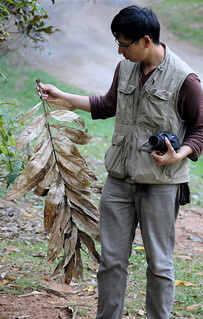 My quest to know plants have gone deeper still – and now I am delving deep beneath their bark. As an ecologist, I have always had a deep yearning to understand how tropical rainforest plants can find solutions to living in a common environment. How do the grand tropical laurel trees raise those lofty crowns to the canopy? What has come with being a shrub and giving up with the competition for growing tall? And just how do lianas do their thing? Just like people having a diversity of professions to provide different services to their community, trees, shrubs and vines are just some of the ways tropical rainforest plants have diversified into different ecological groups to cohabit a forest environment. Trees occupy different strata in the forest. Sun-loving canopy species claim the prime spots in the well-illuminated canopy, while shorter trees make do with the shade of the subcanopy. Then there are also “sun-fearing” shrubs that have found their place in the deep shade and barely grow taller than 2 meters. Conspicuously in tropical rainforests also, there are thick-stemmed lianas whose gnarled-twisted stems tangle and literally tie the forest together. And also, there are more open or marginal environments in tropical rainforests, where a suite of pioneer species reside. These species of trees and shrubs are more able to cope with disturbance and exposure, and are typically hate to be in the shade. So the question arose as to whether plant from all these different lifeforms will have different ways to ecological strategies to deal with the needs to transport water. In an earlier work in the journal PLOS ONE, our research team at James Cook University did a study looking at how eight different species of rainforest trees transport water through their trunks. It was then that I became smitten with the inner mechanisms of plants, and fascinated how the little pipes or the vascular system within a plant’s stem enable a plant to conduct water. Now that I had had a glimpse of the inner beauty beneath the bark of plants, I just had to see more. 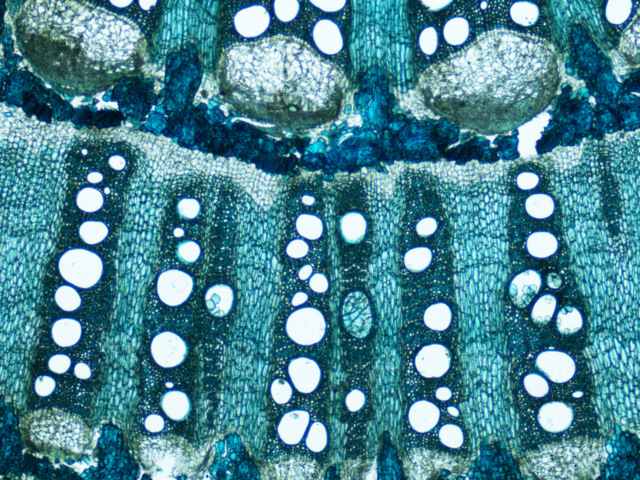 We set out to investigate how wood anatomy may reveal the different ecological strategies of rainforest plants, which has recently come out in Functional Ecology. Our study was based again in the Daintree, one of Australia’s prime lowland tropical rainforest. I’ll probably be shameless and say that we used the permanent monitoring plot for which we had previously published a full species list for. We collected stem wood from 90 species of plants (15 species each) from within six ecological groups: mature-phase trees, understorey trees, understorey shrubs, pioneer trees, pioneer shrubs and lianas. In the lab, we slided up wood stem sections for microscope analysis to measure vessel features such as vessel sizes, frequencies and grouping. These features can be hypothesized to have a direct influence on water transport and plant performance. 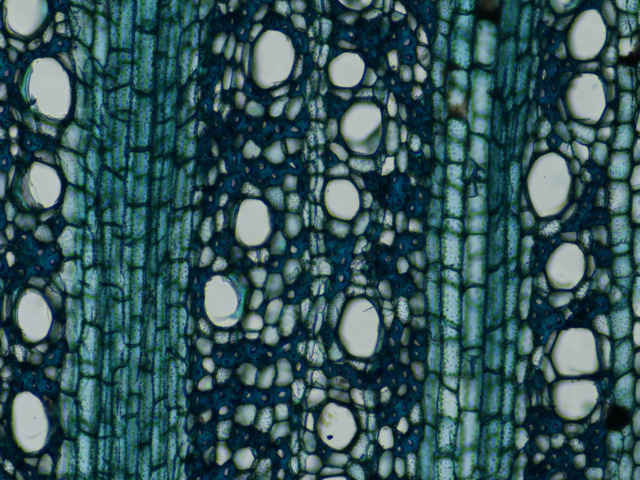 Next we wanted to understand how anatomical characteristics of plant vessels influences plant performance. For this we used the leaf material for biochemical analysis, looking at leaf carbon isotope ratios. Basically, this analysis would enable us to get an idea of how well our study plants are photosynthesizing and how efficiently it is using water. I also got to use the Daintree Rainforest Observatory canopy crane to collect some of our samples. This construction crane is one of a global network of dedicated cranes used for scientific research work. With great mastery, the crane operator Andrew Thompson took us within the gondola 30-35m above the canopy of the trees where we could collect leaf samples with ease. For mature-phase canopy trees such as the Pink Satinash (Syzygium sayeri) which can get to over 30m tall, canopy crane access to leaves are certainly appreciated. Mature-phase trees such as the Pink Satinash (Syzygium sayeri) have typically large vessels. (Fast forward from the gruelling laboratory, analysis and writing sessions). viola! Our results show that yes, plant performance (how well our plant ecological groups use water) is related to the size of the vessels. One interesting conclusion we could draw from our results was that vines are very much like pioneer trees in their potential efficiency in transporting water, and also in terms of their plant performance. Shamelessly again, I point to our published article for the sciency nitty gritty. What we could not show in our article was the joy of seeing the inner workings of species that we have come to know so well. Trees clearly had larger vessels than shrubs, as one might expect from the stature differences between these two ecological groups. However, within both, there is much diversity in the way the vessels appear. The Buff Beech (Gomphandra australiana), an understorey tree revealed a beautiful intricate pattern of vessels, fibre, and parenchyma cells that would be worthy of a t-shirt print. In terms of vessel size, the local Bernie Bean (Mucuna gigantea) has the largest vessels of them all. This could be seen with the naked eye upon making a stem cutting. 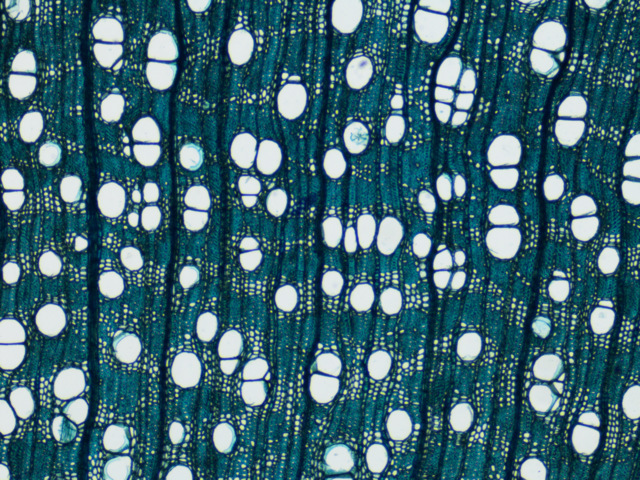 But beyond having big vessels, we found that vines have a huge diversity of patterns in their stem anatomy, in particular the way they arrange their parenchyma tissues. This diversity is in and of itself worthy of a dedicated study. The Common Milk Vine (Pycnarrhena novoguineensis) and it’s drammatic wood anatomy. So to close, you might ask if I found the “deeper truth from which they spring” poring through thousands of vessels. This entry was posted in Ecology, Habitat - Rain forest and tagged Cape Tribulation, Daintree, Daintree Rainforest Observatory, Functional anatomy, Functional ecology, Gomphandra australiana, mature-phase trees, pioneer shrubs, pioneer trees, plant anatomy, plant hydraulics, plant vessels, Pycnarrhena novoguineensis, Syzygium sayeri, understorey shrubs, understorey trees, vessels, Wet Tropics, Wet Tropics World Heritage Area, wood anatomy. Bookmark the permalink. Thanks Paula. Nothing brings me greater joy! Thanks Nelda, it would be a dream come true to publish a book. Keep me posted on your book. If you send a pdf I would be glad to write a short piece on Mary once your book comes out.